Since I recently wrote about what Microsoft or any other company needs to do to compete with the iPad (see 5 Strategies Microsoft Must Use to Succeed Against the iPad), it would be nice to take equal time to talk about how Apple competes. The latest models of iPods give a great set of examples of the strategies that Apple uses. Don't give the competition a leg to stand on. 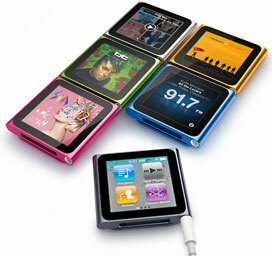 Apple has the iPod shuffle at $49, the iPod nano starting at $149, and the most expensive iPod touch selling for $399. Apple combines three different models and different memory capacities to blanket almost the entire price range between these extremes. That leaves almost no room for a competitor to challenge Apple on price alone. No, Apple doesn't cover zero to $48 range, but there probably isn't much profit at the very bottom. Innovate but stick with what sells. I loved how Apple switched back the design of the Shuffle. Apple isn't afraid to say, "Sorry, that buttonless design didn't sell." Instead of sticking with a bad idea, Apple keeps the focus on sales over ego. This same pragmatic approach shows up with the iPod classic. It is an old design, and Apple clearly favors the iPod touch, but as long as there is demand, the classic will remain available. Besides, a proven design gets more profitable over time, because all the bugs in design and manufacturing have been worked out. Apple dropped the camera from Nano when adding a camera to the Touch. That makes the Touch more like the iPhone, so Apple skimps on the camera quality (the main camera on the iPhone 4 is 5 megapixels; on the 4G iPod touch, a mere 0.8 megapixels, but good enough for 720p video - and a big step up from the 0.3 megapixel camera in last year's iPod nano) to separate it from iPhone. Apple is the master of upselling its products. If you are the Brand Leader, then lead, don't follow. Others clearly try to follow whatever Apple is doing, so Apple has to change what it is doing to stay fresh. As the design leader, Apple gets to test the water with new ideas. Failed designed by Sony, such as the Walkman Bean, are laughed out of the market for not measuring up to the iPod. Apple, on the other hand, is free to change size, shape, controls, etc., because it's the leader. It keeps the competition off guard and tests new ideas for their strengths. Maybe the 1.5" touchscreen on the 2010 iPod nano is too small, but Apple can try it without worrying that their product won't measure up. Maybe a year from now they will revert back to an earlier design, but Apple has the Touch and the Classic to hedge its bets if customers don't like the new Nano. And if it sells well, Apple can launch new variations next year. Either way, it moves the design where Apple wants to go, and Apple is not seen as following someone else. All the Nanos are shown with a different artist on the screen. Apple gets to use all sorts of artists to promote iTunes. And Apple shows off its environmental status report. What each of these displays is who their customers are or want to be. Maybe you are an uncool, environmental polluting, music hating person who still likes Apple, but more likely if you are a Apple fan, then Apple's message connects to you on more than just the gadget level. Anyone can sell an MP3 player, but only Apple is designed for a sophisticated person like you. The gadget and the message have to match. Apple is better at staying on message than a politician during an election year. Apple delivers again and again, because it keeps that focus while other companies only look short term. For a mature product line like the iPod (almost nine years old), Apple has done a good job of keeping it interesting.